It does not get any clearer than this. 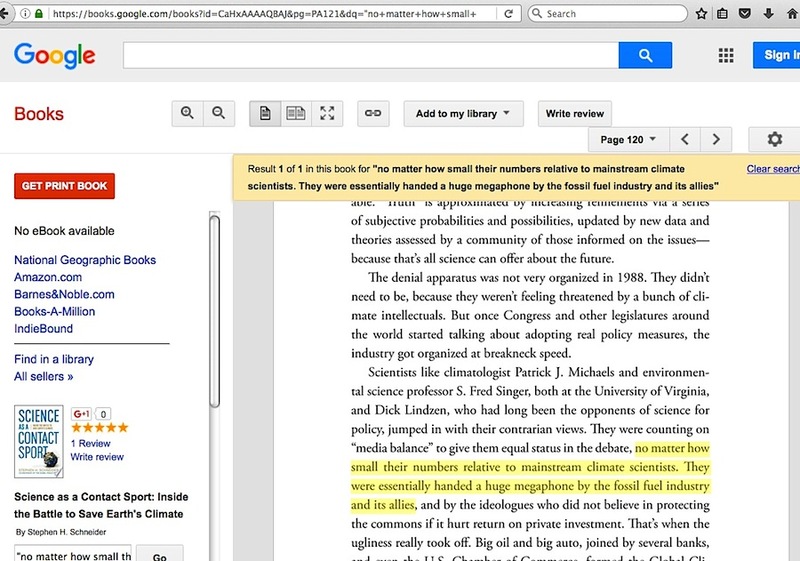 It should finally put to rest the claims of climate deniers that there is a scientific debate about global warming. Of course, this bunch isn’t known for being reasonable or susceptible to facts. But maybe the mainstream media outlets that have given deniers a megaphone will finally stop. That elemental question is what mostly drew me into this issue in the first place. 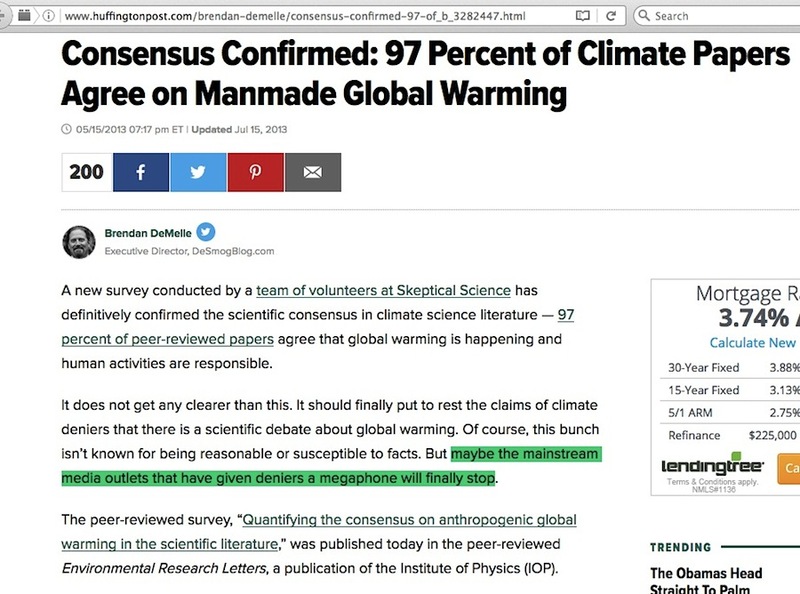 Skeptic climate scientists existed, but were given zero air time on a prominent news outlet which was otherwise famous for offering fair and balanced reporting. Elsewhere, what little ‘megaphone’ they had was thwarted by hostile interviewers, who permitted no rebuttal against zinger statements aimed at them. 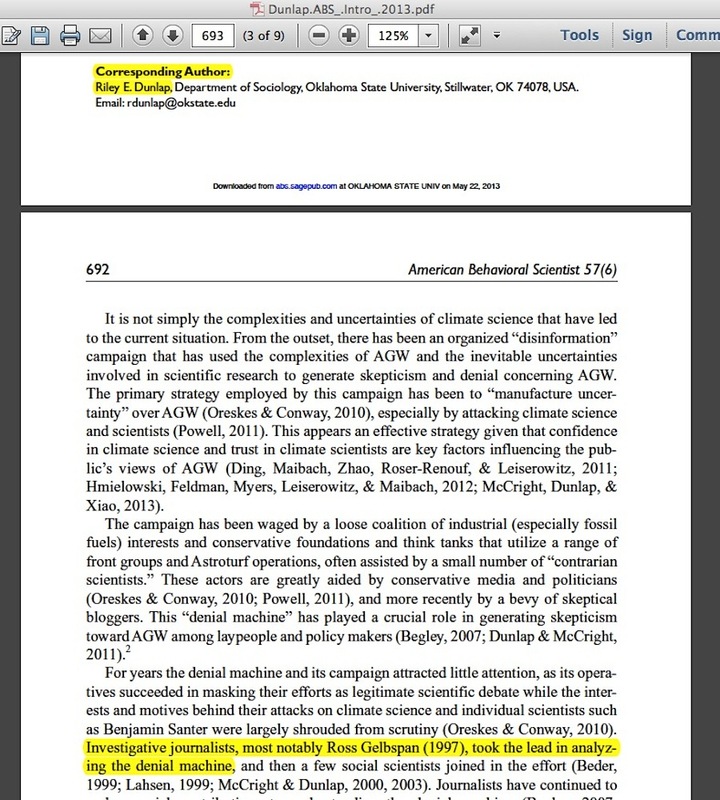 Plus, if people who know skeptic climate scientists / skeptic speakers quite well are asked to count up the number of times over the last 10 to 15 years when mainstream media outlets featured skeptics’ viewpoints in an unbiased way, they’d have difficulty using up all the fingers on both hands. But as usual in my work, there’s more to the story, with regard to that “megaphone” word. MJ.com: It’s interesting that the names of the skeptics you encountered continue to pop up. Do they keep appearing because they’re the only ones out there or because they’re especially good at what they do? RG: It’s not that their message is getting out there due to its merit. 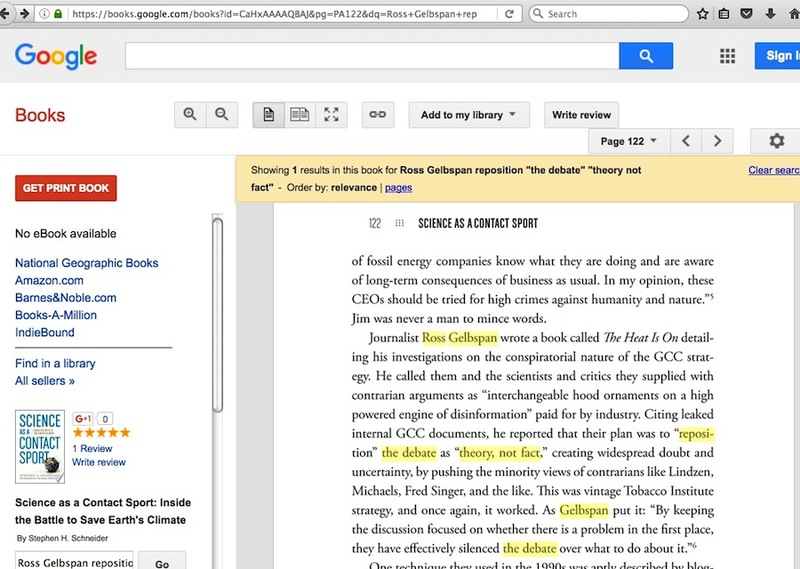 It’s part of a deliberate and concerted public relations campaign by the fossil-fuel lobby. 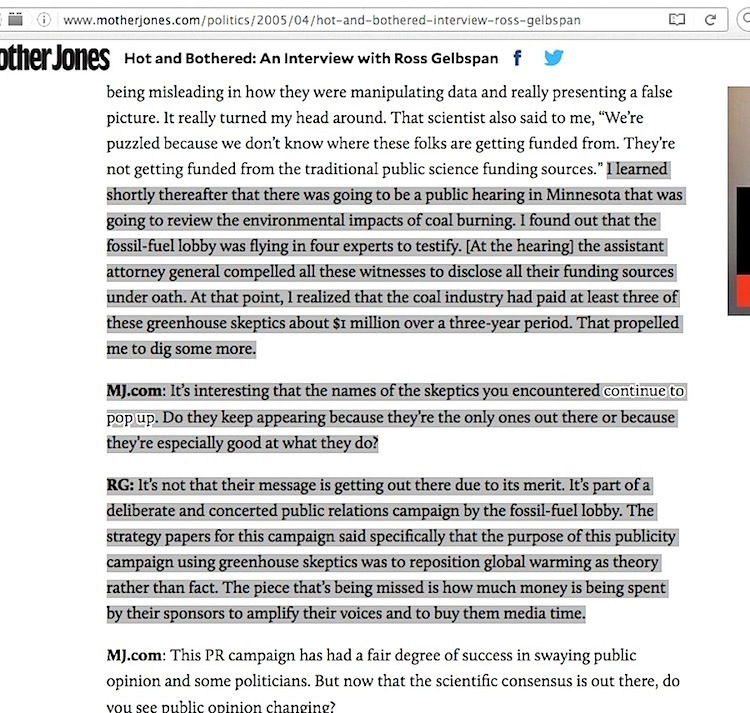 The strategy papers for this campaign said specifically that the purpose of this publicity campaign using greenhouse skeptics was to reposition global warming as theory rather than fact. The piece that’s being missed is how much money is being spent by their sponsors to amplify their voices and to buy them media time. 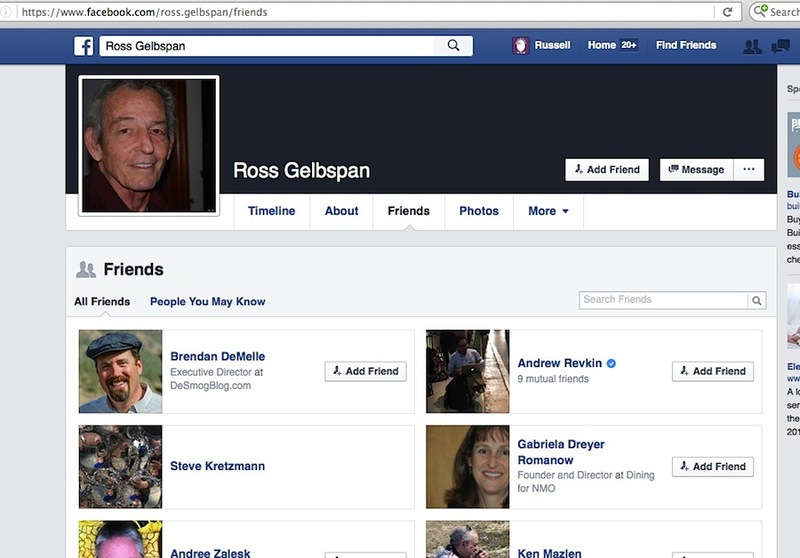 But does anyone talk about this ‘big megaphone’ situation prior to Gelbspan? 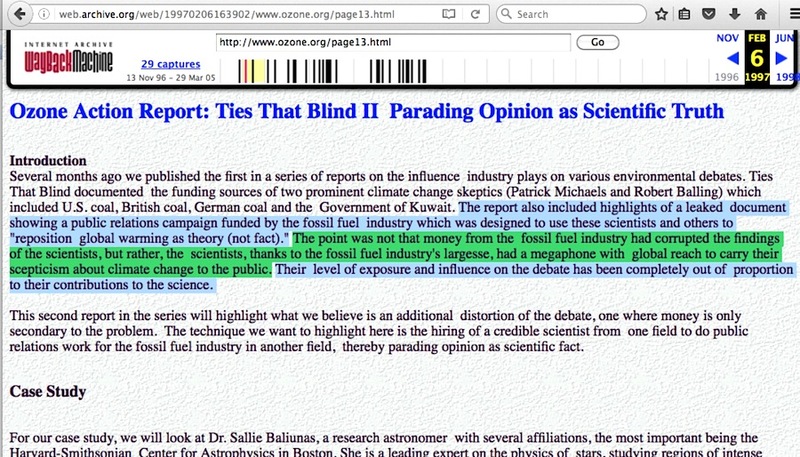 Yes, and that’s where this thing ends up with a weirder problem courtesy of the same Ozone Action place where Gelbspan and their people simultaneously somehow ‘obtained’ the documents which have long been used to accuse skeptic climate scientists of accepting fossil fuel industry bribes in exchange for lying to the public about the certainty of catastrophic man-caused global warming. Several months ago we published the first in a series of reports on the influence industry plays on various environmental debates. 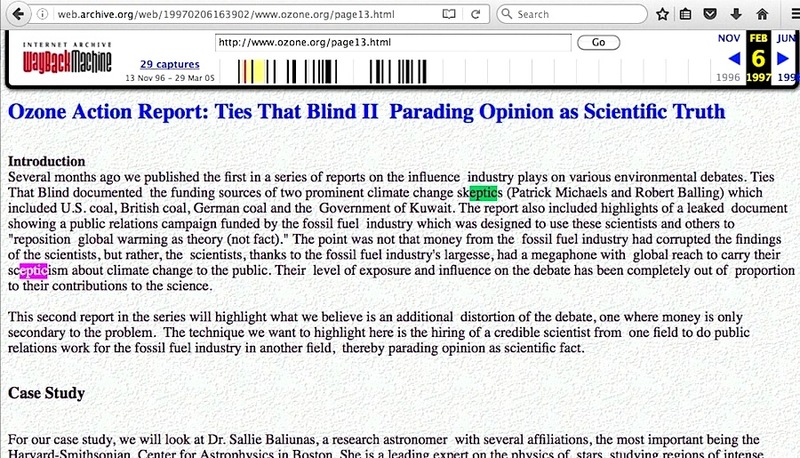 Ties That Blind documented the funding sources of two prominent climate change skeptics (Patrick Michaels and Robert Balling) which included U.S. coal, British coal, German coal and the Government of Kuwait. 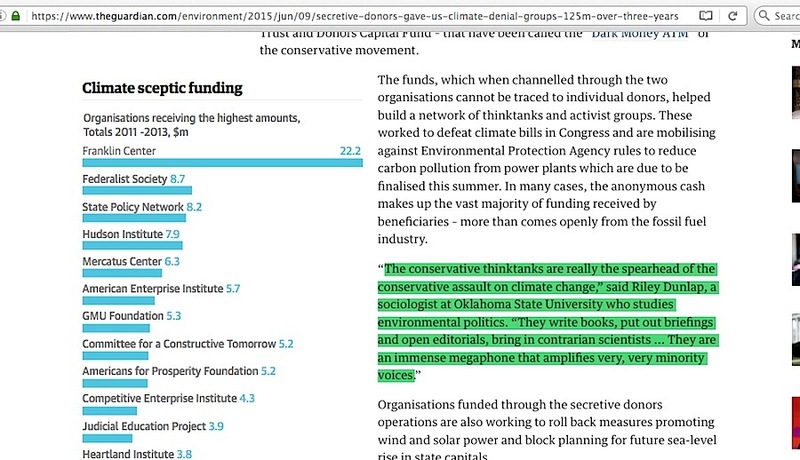 The report also included highlights of a leaked document showing a public relations campaign funded by the fossil fuel industry which was designed to use these scientists and others to “reposition global warming as theory (not fact).” The point was not that money from the fossil fuel industry had corrupted the findings of the scientists, but rather, the scientists, thanks to the fossil fuel industry’s largesse, had a megaphone with global reach to carry their scepticism* about climate change to the public. Their level of exposure and influence on the debate has been completely out of proportion to their contributions to the science. See the pattern here? 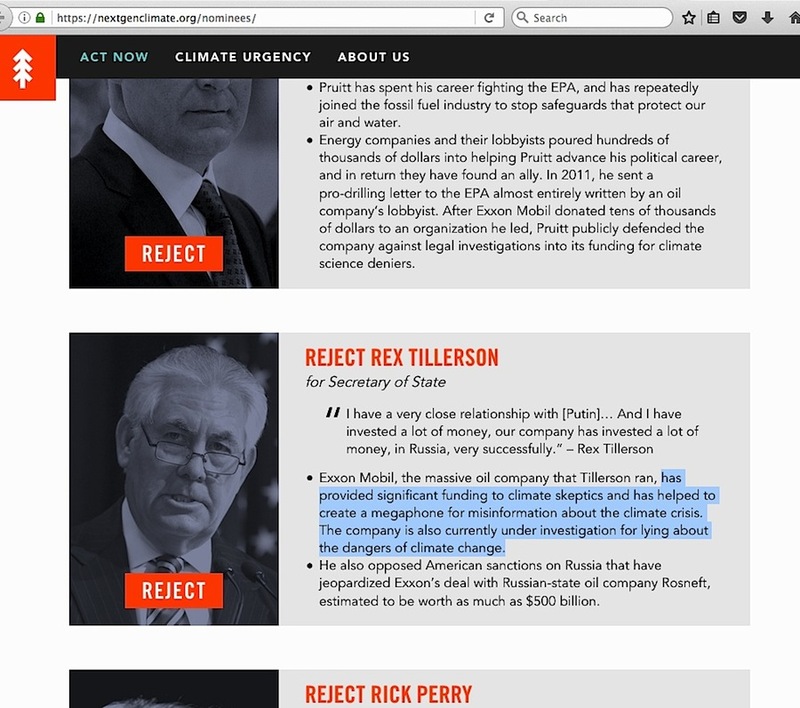 A lineage of talking points leading up to right now about a very, very small minority of corrupt skeptic voices amplified by an immense megaphone created, orchestrated and funded with evil intent by the fossil fuel industry. So …. the point was that truth-tellers – all two of them – were loudly effective because they were handed a giant corporate-funded megaphone? This is beyond ironic. Enviro-activists using the mainstream media’s monster-megaphone to push claims of catastrophic man-caused global warming as a settled science needing immediate fixing have almost completely drowned out the opposition, and an unmistakable part of the blaring 20 year+ message was the demand to ignore industry-bribed skeptics. 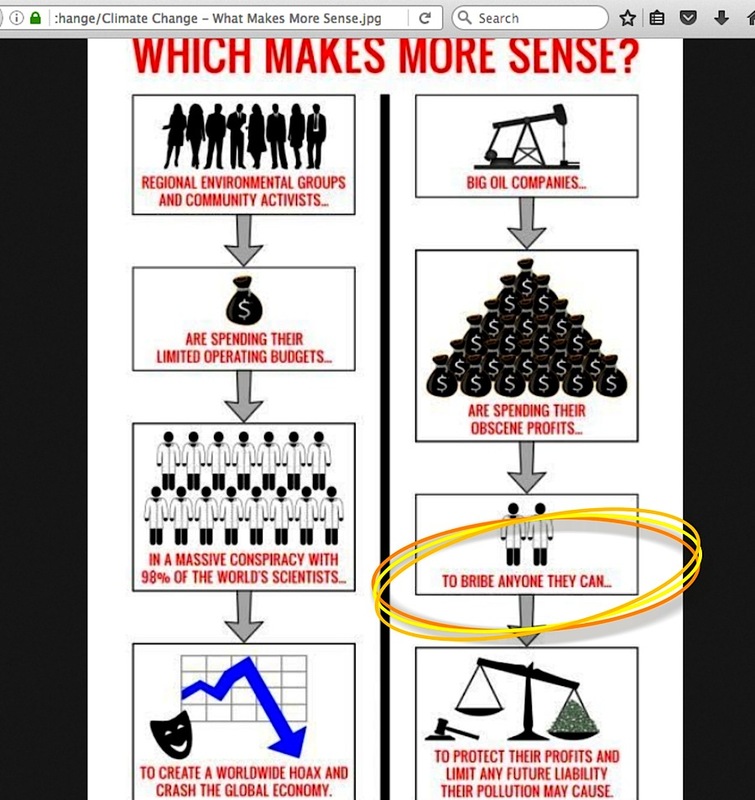 Swallow these single-serving talking points from enviro-activists at your own peril? Perhaps so, at the risk of being asked exactly when, how, and where the science was settled, and what evidence exists proving the bribery occurred. Along with questions of why the same names always pop up around these central talking points. 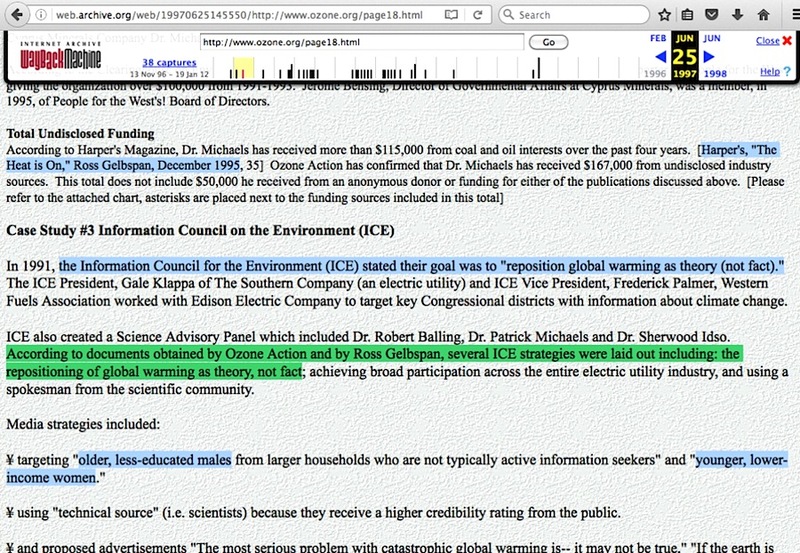 The folks in greatest peril here, of course, are those in that clique, if these same questions are posed to them during serious top-level investigations….. along with a tougher question on whether the core people of this clique actually believed that skeptic climate scientists had been corrupted by industry payments. 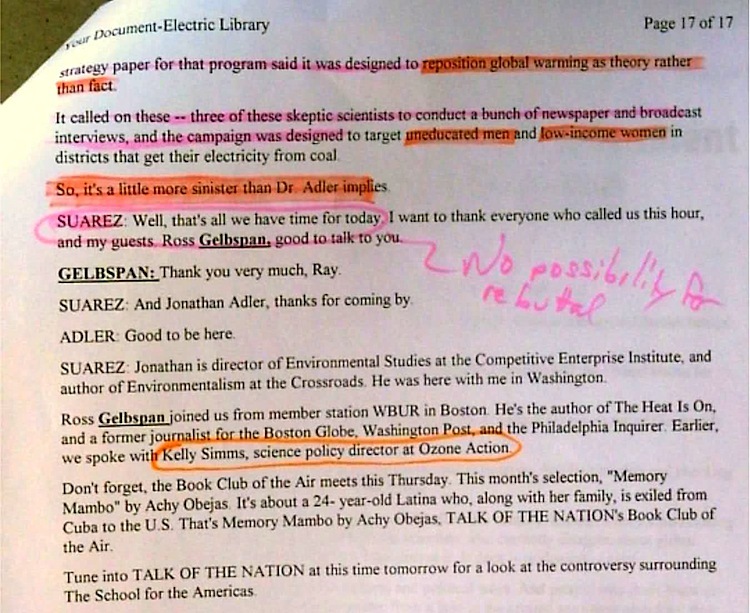 This entry was posted in Narrative derailment, Ozone Action, Repeated talking points and tagged Dunlap, Stephen Schneider by Russell Cook. Bookmark the permalink.